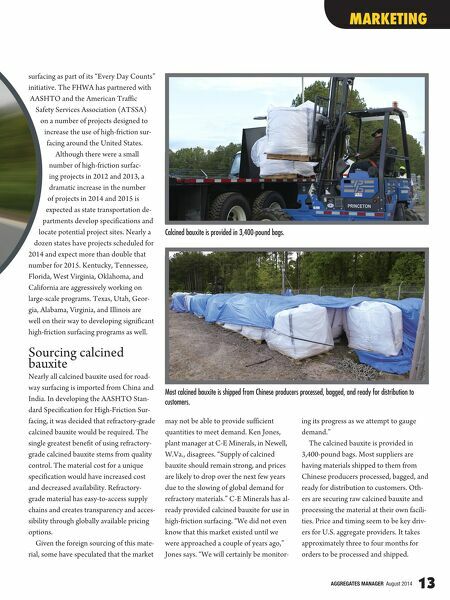 AGGREGATES MANAGER August 2014 12 Road-gripping technologies already in place in Europe and Asia are now being implemented in the United States. Learn what this means for material producers. by Robert N. Dingess Building Better Roads R oughly 33,000 people are killed annually in mo- tor vehicle crashes on U.S. roadways. According to the National Highway Traffic Safety Administra- tion (NHTSA), the annual economic costs of motor vehicle crashes is $277 billion. Thanks to renewed efforts by the Federal Highway Admin- istration (FHWA) and the American Association of State Highway and Transportation Officials (AASHTO), a technology used in Europe and Asia is being applied to improve roadway safety at high-risk locations such as curves and certain in- tersections. The technique, known as high-friction surfacing, uses a specialized epoxy binder into which processed calcined bauxite is dropped. The result is a dramatic increase in the grip provided by the roadway surface. Calcined bauxite Calcined bauxite is used in the refractory process in the iron and steel industries. High-end calcined bauxite is also the key component in a high-friction surface. Creating a calcined bauxite that meets the standard for roadway application requires heat- ing the bauxite to 2,732 degrees Farenheit (1,500 degrees Celsius). The current minimum aluminum oxide content requirement in AASHTO's specifica- tion is 87 percent. The resulting material has a hardness just below that of diamonds. The process for applying high-friction surfacing is similar to that of sealing bridge decks. The key difference is that most bridge deck surfaces are not subjected to the friction demand levels found in horizontal curve or intersection applications. The binding systems for high-friction surfacing are required to account for this additional friction demand through higher compressive strength. A properly installed high-friction surface treatment is expected, on average, to last up to 10 years. FHWA "Every Day Counts" While comprising only about 5 percent of roadway miles, roughly 25 percent of all fatal crashes occur at horizontal curves. 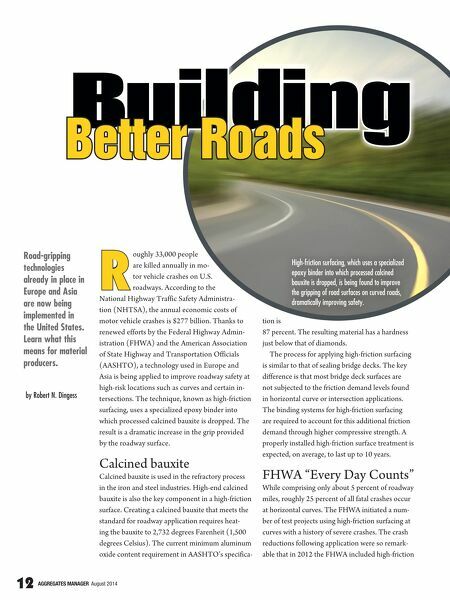 The FHWA initiated a num- ber of test projects using high-friction surfacing at curves with a history of severe crashes. The crash reductions following application were so remark- able that in 2012 the FHWA included high-friction High-friction surfacing, which uses a specialized epoxy binder into which processed calcined bauxite is dropped, is being found to improve the gripping of road surfaces on curved roads, dramatically improving safety.